I’ve only aborted a couple session once in my entire career of nearly a decade. 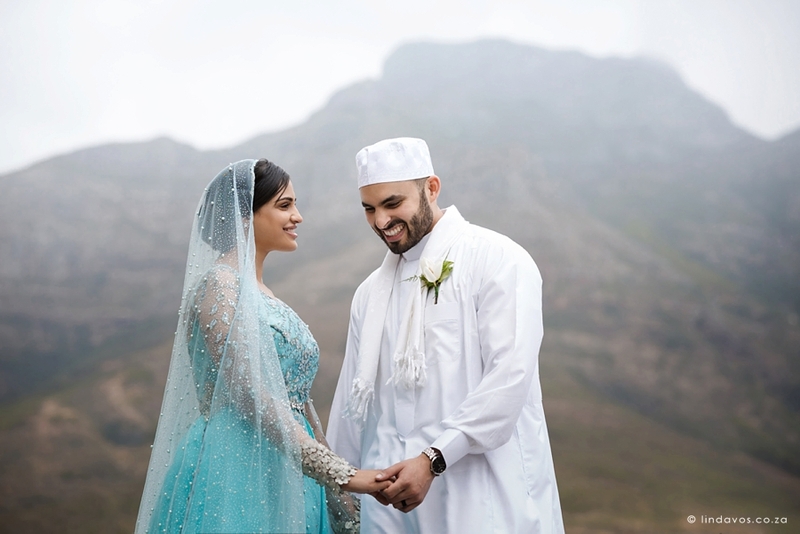 Although smaller sessions can be moved due to gale force winds, weddings are a once in a lifetime event and needs to go ahead come rain or shine. Everything needs to be captured as the story unfolds, even when there is severe time constraints. This even holds true for some engagement sessions as myself and my clients often travel from the other side of the country for these on a date that was pre-arranged. As a professional in my craft, I always need to think outside of the box. Here are a few examples of me braving less than ideal situations to create unique images. It is important to utilise the maximum potential of ANY location. 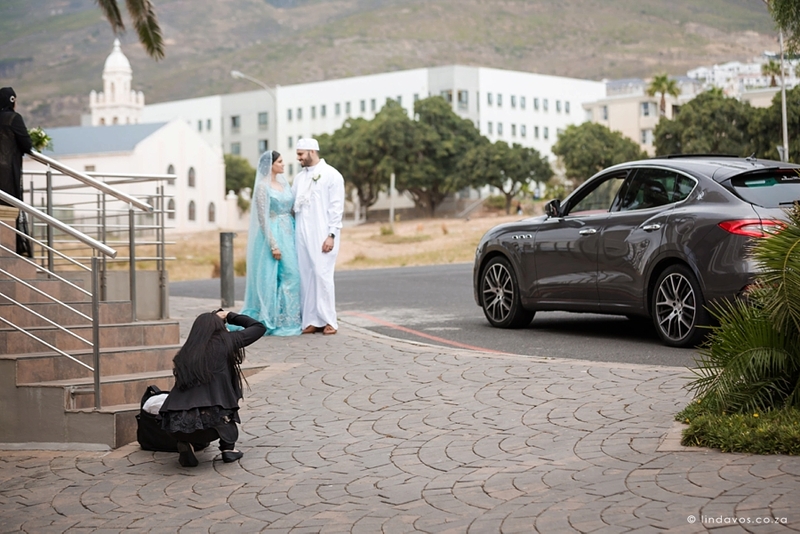 With no time to move to another location before the couple had to change for the reception, I used a simple parking lot in front of the Mosque before getting into the car to leave, changing my angle and creating a moment by saying something silly. 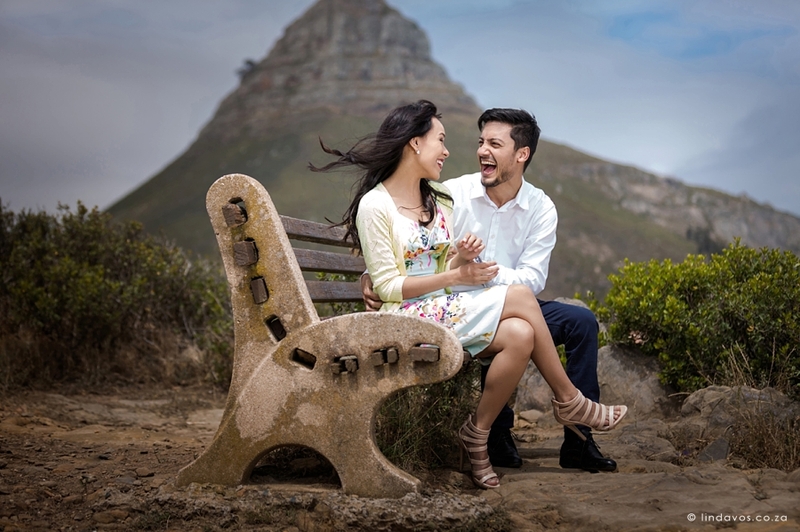 Midday sun is never ideal for taking photos but when a couple has a tight schedule, we have to work with the time we have. A handheld scrim works for closer up images but for wider scenes it is not ideal as the shadow is too small . Using the Profoto B1 with a 2″ octabox to fill in the harsh shadows softens the effect of the overhead sun. 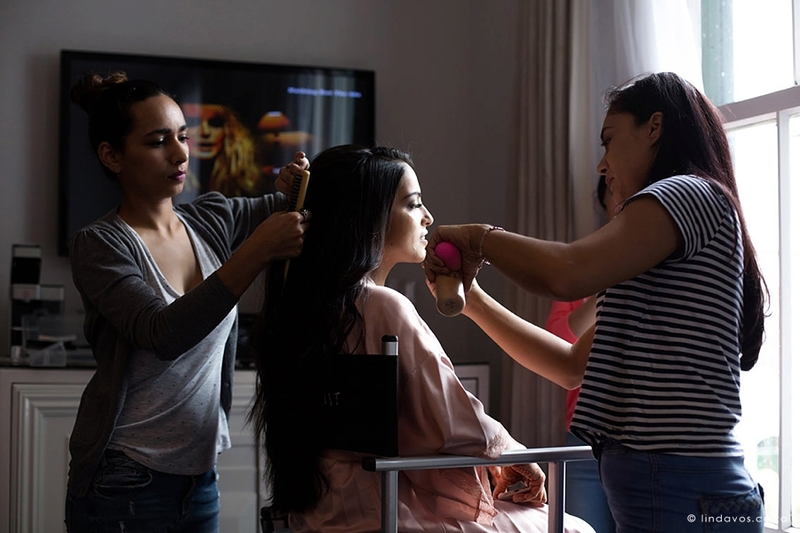 Family, bridesmaids, dress designer, make-up artists and videographers are part of the wedding and will likely be in the bridal room with me more often than not. I’ve had as many as 14 people in a single room. Make-up needs to happen where the light is but if it’s in a small corner, I need to think creatively. By switching off the television and darkening the background by exposing for the highlights, I created a glamorous photo in a not-so-glamorous busy situation. Mid October is Jacaranda season in Pretoria. 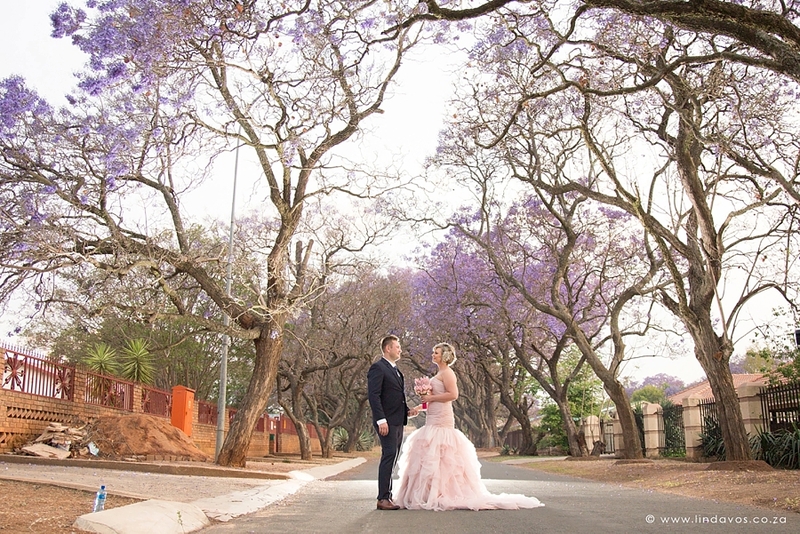 However, this wedding was late September when these purple trees just started blooming. Using the natural afternoon light did not bring out the colour much and returning for a night photo was not an option as it was a few minutes drive from the venue with a massive thunderstorm predicted for the evening. 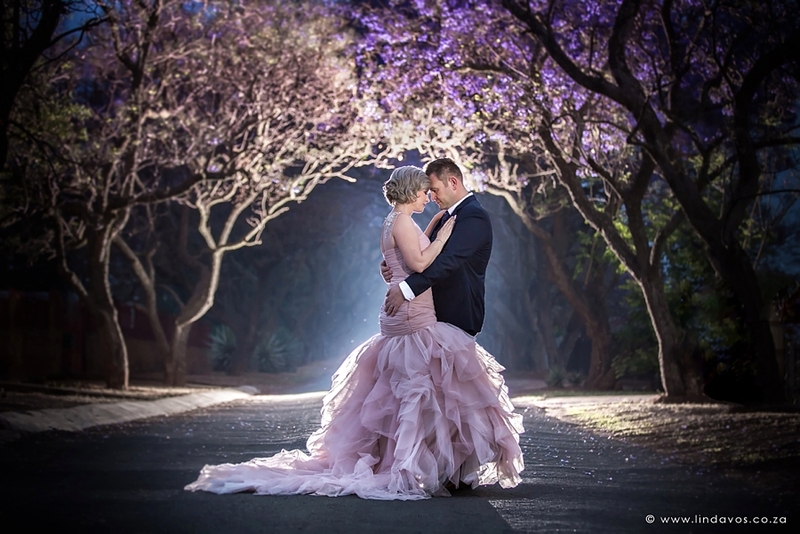 I underexposed, backlit the trees with the 500W full power of my Profoto B1, and filled the couple for a dramatic and vibrant photo. 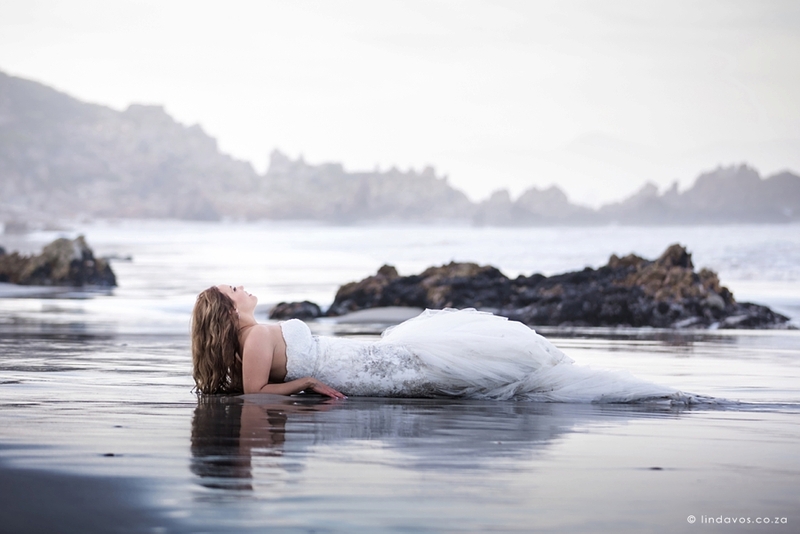 Living in the bushveld and getting married in Cape Town doesn’t give you an opportunity to go to the beach every day, so we decided to go “trash-the-dress” after the wedding. However, they had to leave on the afternoon after the wedding for their honeymoon. 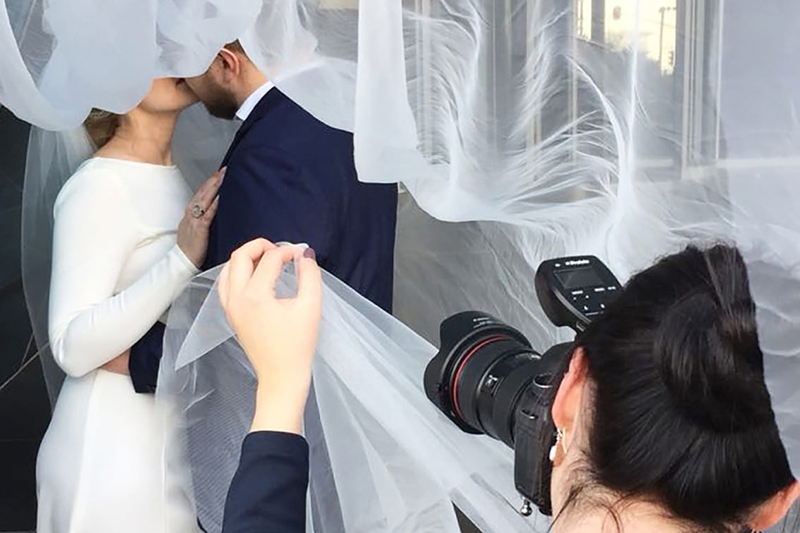 Our only option was to wake up at 4am for make-up touch-ups after a 15h wedding and travel to the beach to catch a spectacular misty sunrise. Don’t have a plan for all the leftover flowers that was used for table décor that you spent a small fortune on? Do something creatively with them on the morning after the wedding and then rearrange them to gift to the closest retirement home. 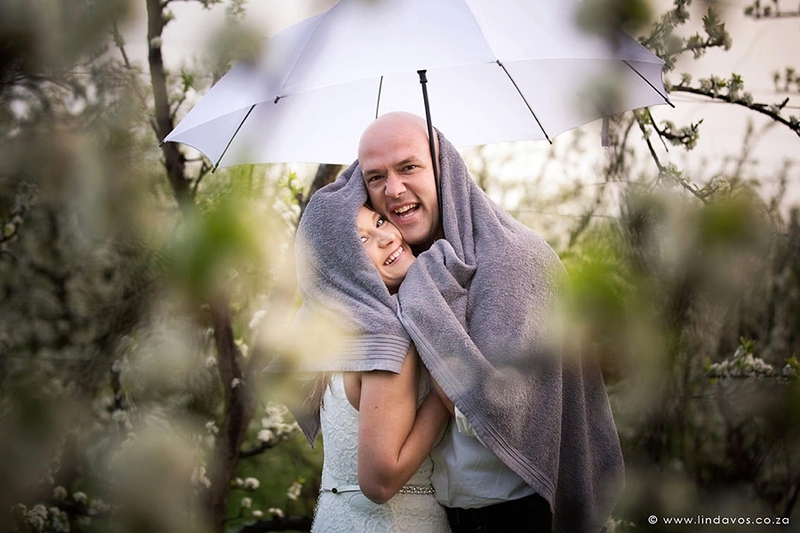 By making a bit of effort and having a bit of patience, we have a unique photo that will add glamour to your album. Besides, who doesn’t want to wear that spectacular dress again! 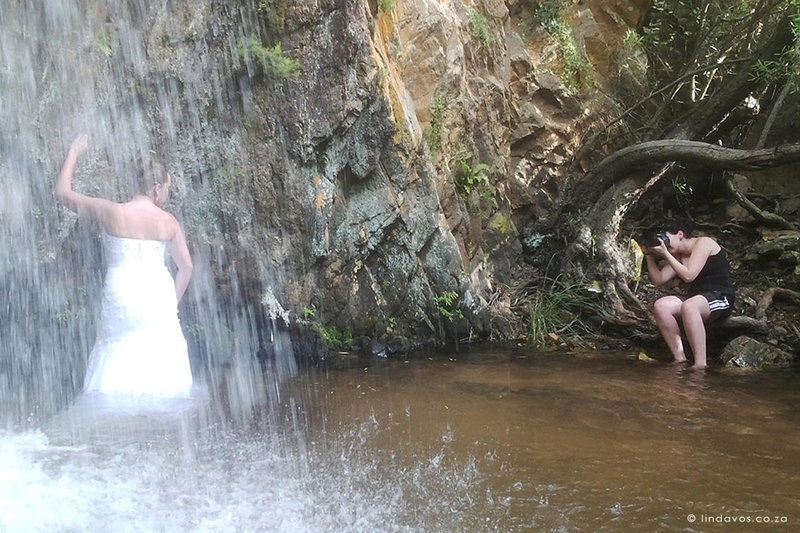 If hiking two hours with heavy gear and a dress is what it takes to get to a stunning location, or climbing hundreds of steps on a wooden ladder to get to a waterfall in the mountains – we do it. 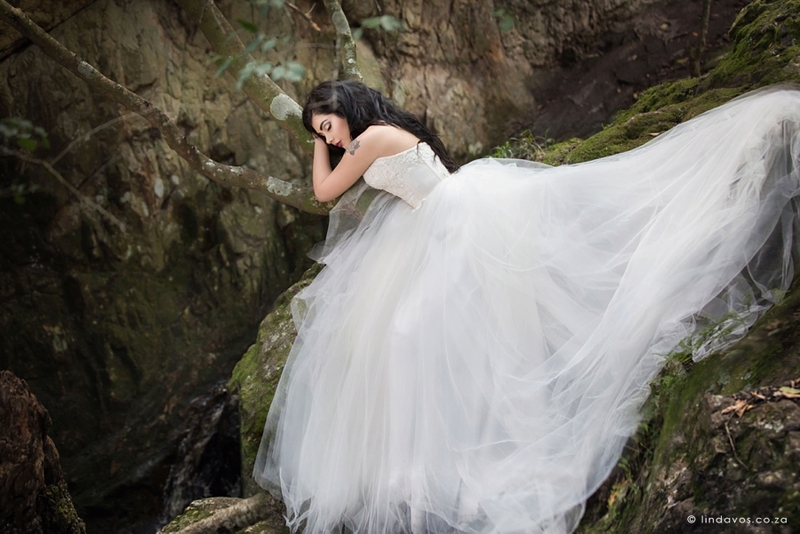 If we want a photo of a bride hanging romantically in a tree like a fairy princess, we will do it. Safety always first though! 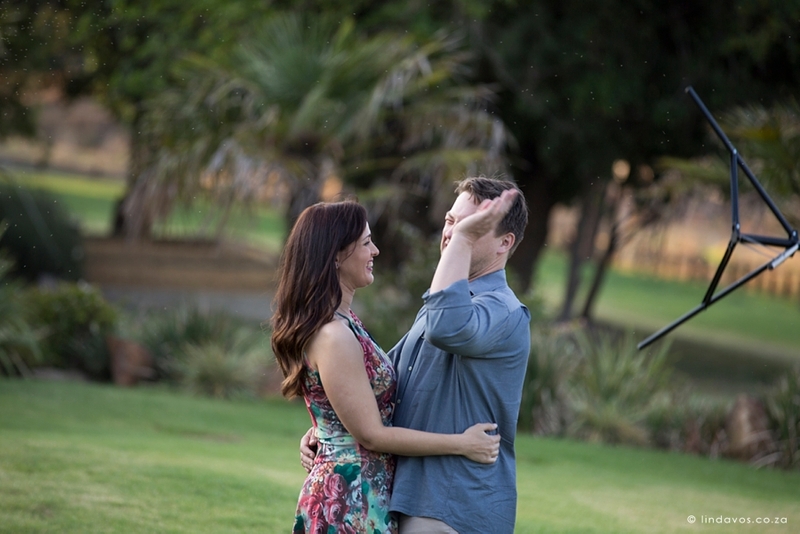 Sometimes something unexpected turns up at a shoot like a rhino approaching, a cat walking into the photo or in this case a swarm of mosquitos zooming around our heads. 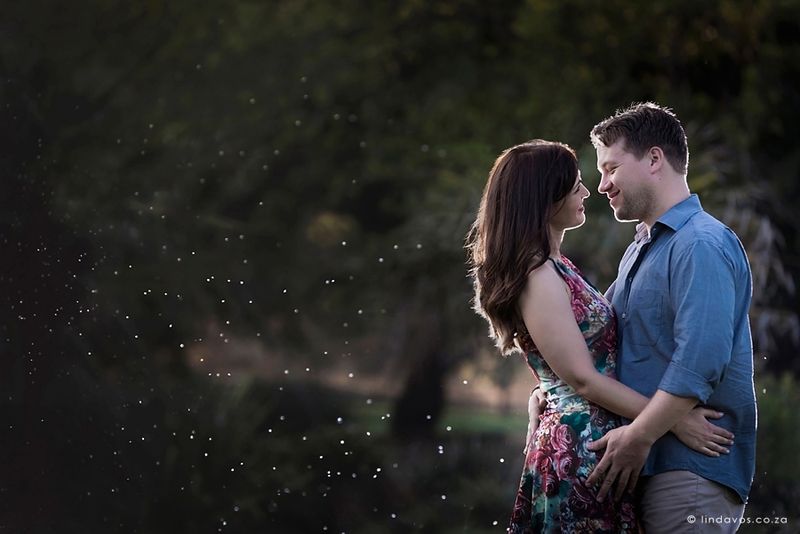 Before running away immediately, we took a few seconds to hold our pose, backlit them and got our romantic “fireflies” photo before slapping and running! I have done many photoshoots in rain, running for cover in between photos when it gets too heavy, waiting it out and continuing again. 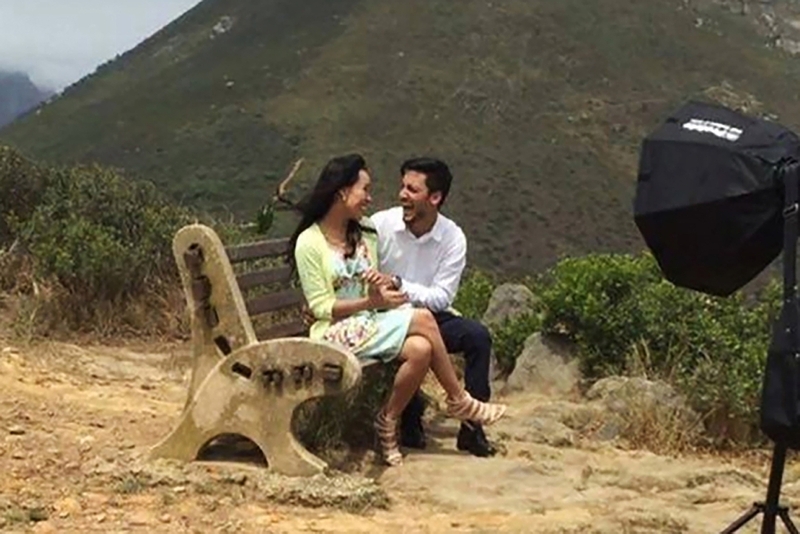 When a couple is keen on braving it, I am too. The photos are always worth the muddy shoes and wet gear and the hot coffee at the 24hour Wimpy afterwards is so worth it! 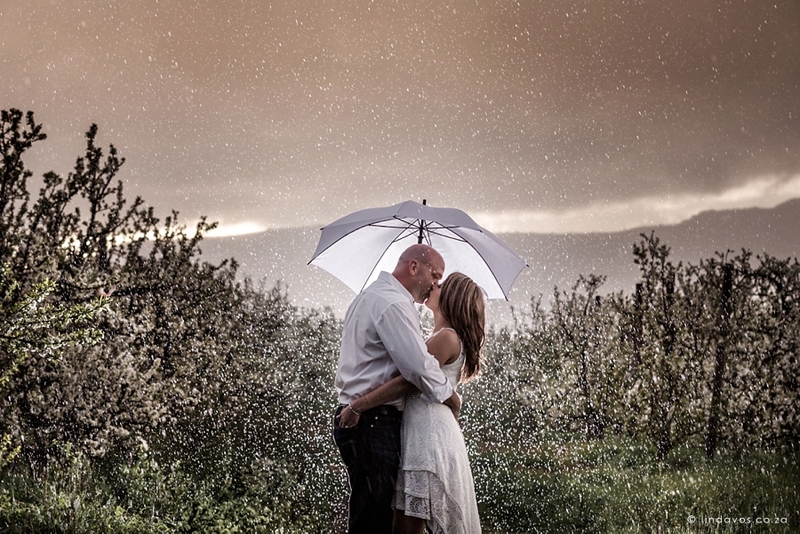 When a couple sees one of my rain photos and request a similar photo on their wedding night, what to do if it doesn’t rain? 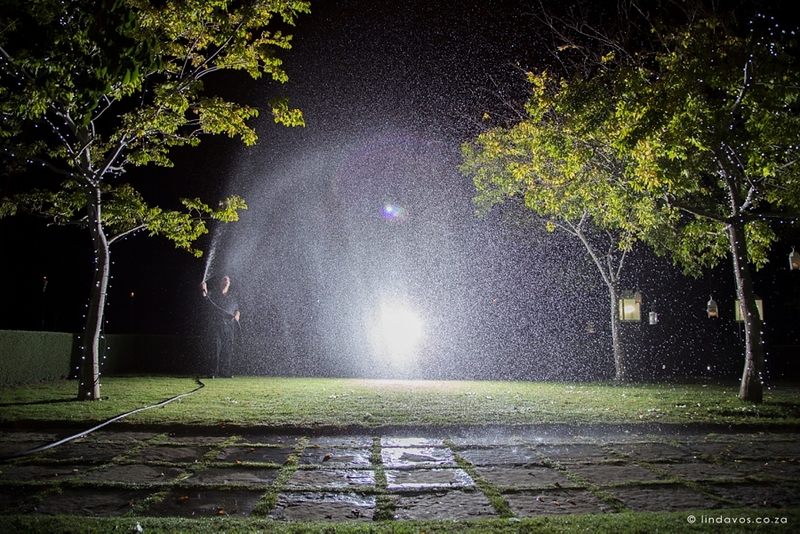 Grab a hose, have the venue gardener on standby at the tap and do our best to make this request happen. 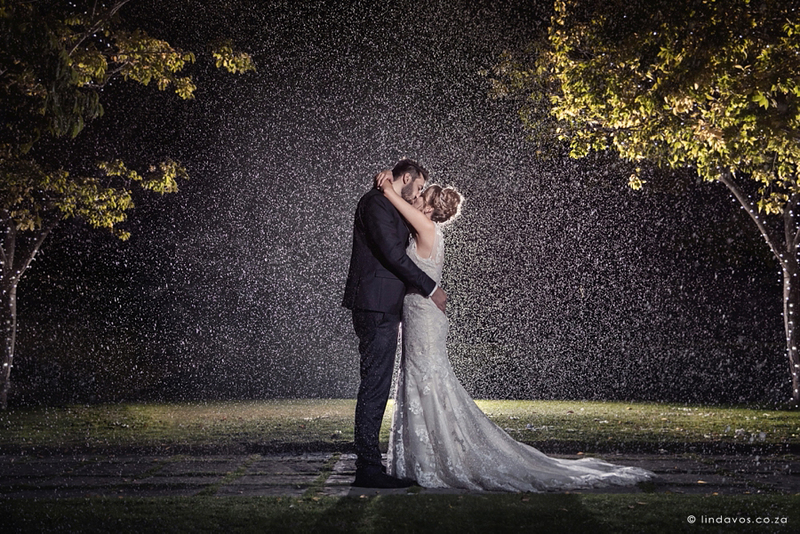 After a few tries and lots of patience to have the water spray just right, the couple has their photo. Working near water with camera gear is risky, and even more so IN the water. 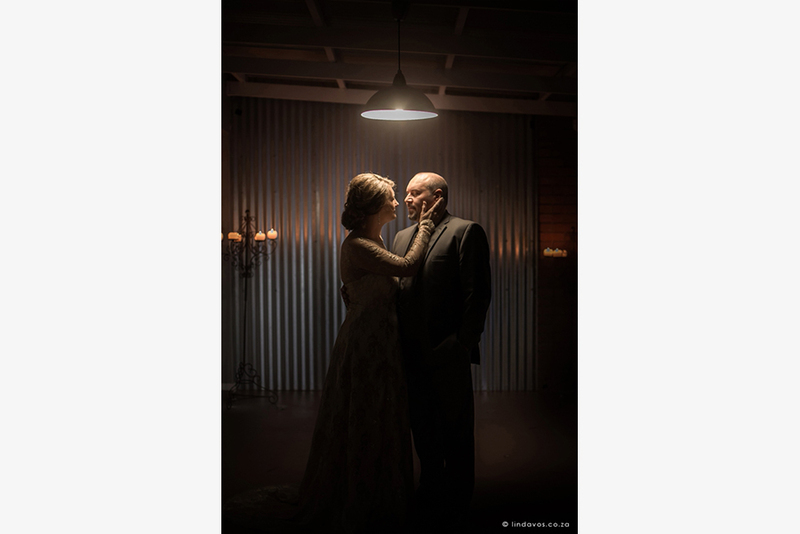 I am not afraid to take risk to get unique photos if my couple is keen on exploring themes and locations that are unexpected. The reward always surpasses the risk and doing something different is always fun! 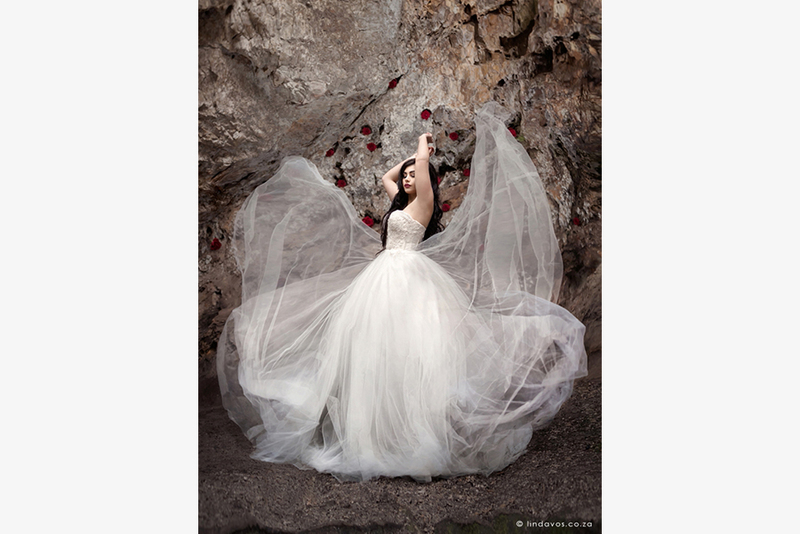 When we want that dress to do something specific, we will persist until we have the photo we want! Doing something unique takes patience but the result is always rewarding. 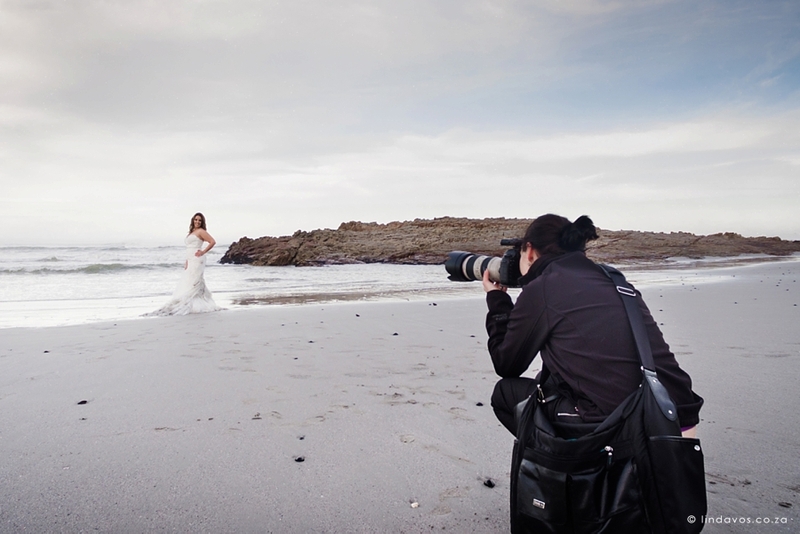 Having an assistant at sessions is not always necessary but especially where big dresses are involved it really helps. 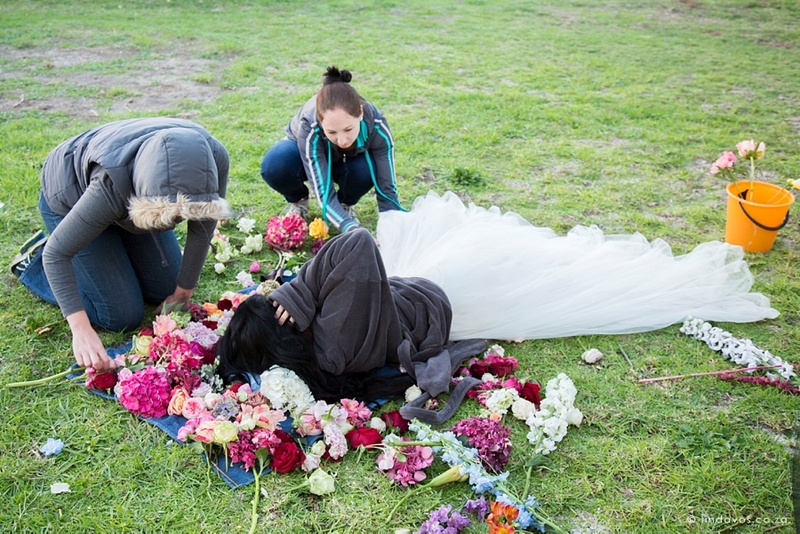 We woke up at 3am for this post wedding Bloubergstrand session. The idea was to catch sunrise over table mountain. However, heavy mist covered most of the beach, so using the Profoto A1 on low power, I created a soft sunrise light feeling to fill in an otherwise dull and flat light. 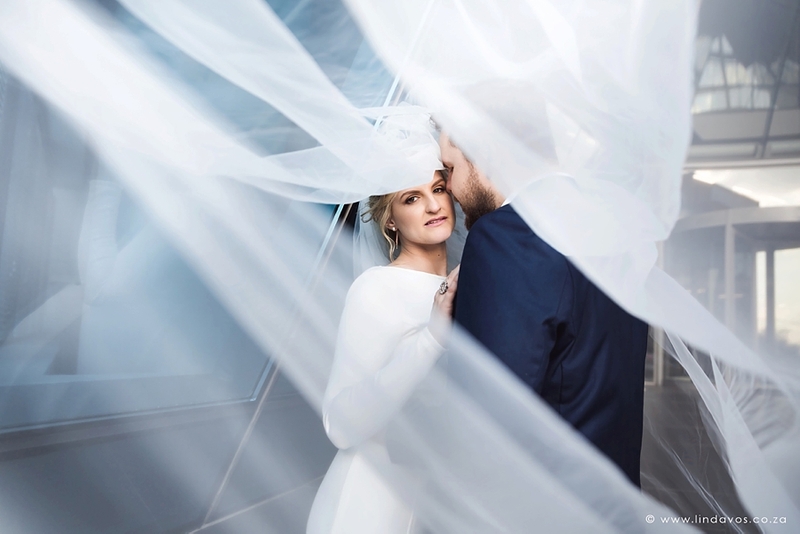 I absolutely adore long veils, even just for the photos. 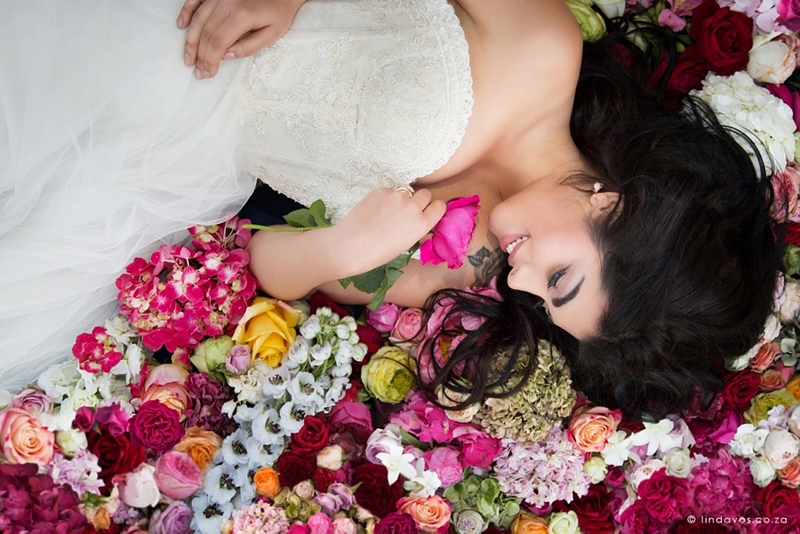 Having a prop to work with adds so much romance to an image, whether in the couple shoot or the bridal portraits. When it’s windy they flow beautifully. A classic photo that absolutely has to be taken. 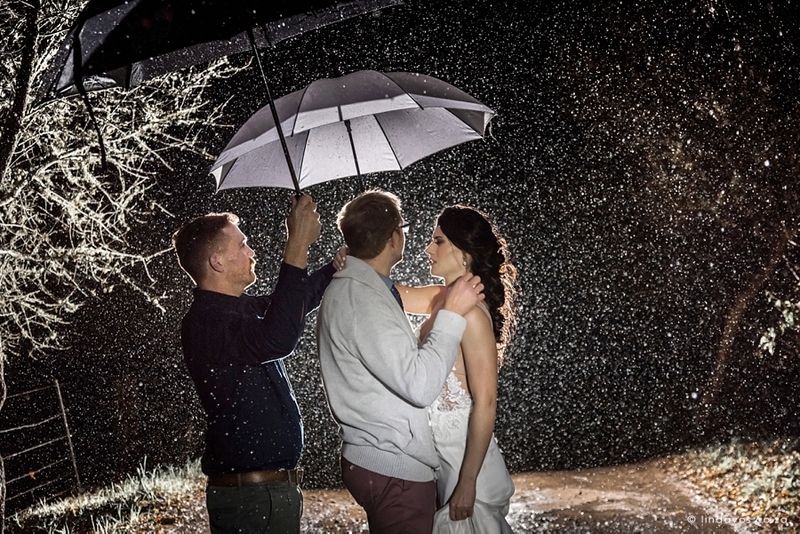 These photos were taken in temperatures close to zero degrees when it started ice raining late in the evening at this wedding. 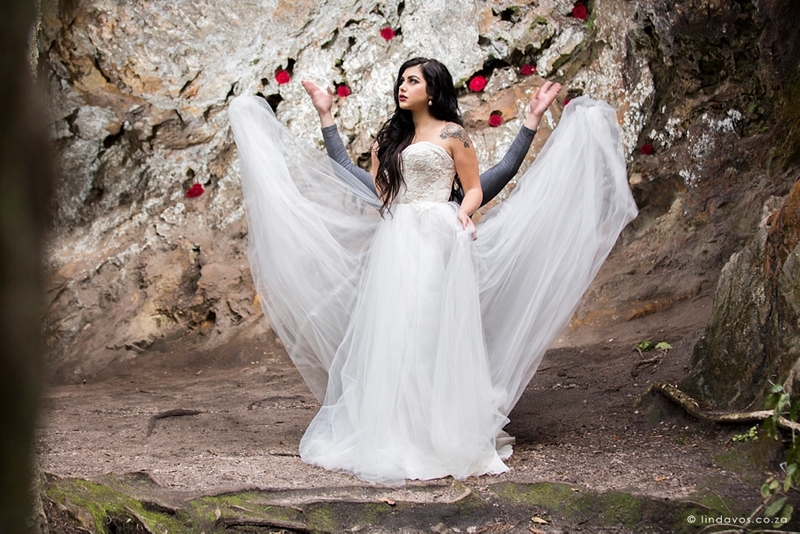 The bride was extremely brave and with some assistance from guests we got incredible photos. We woke up the next morning to snow on the mountains around the venue. 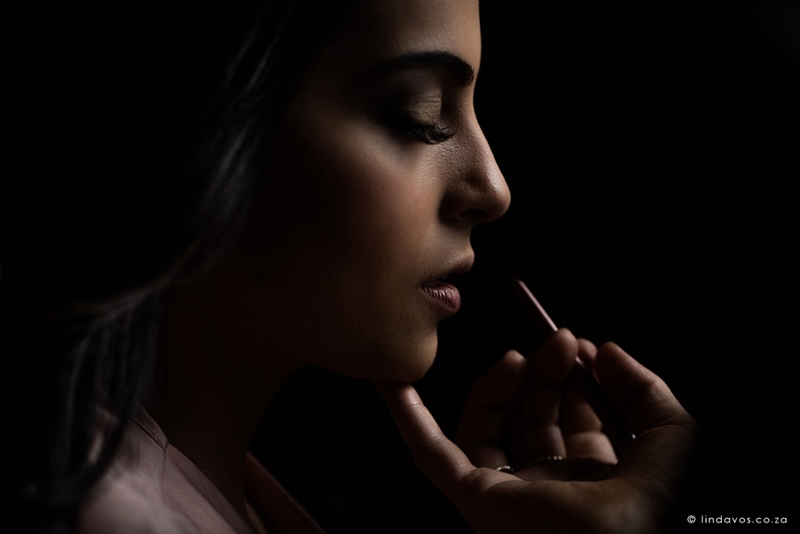 Here is an example of why it is important to know off-camera lighting to use when needed. 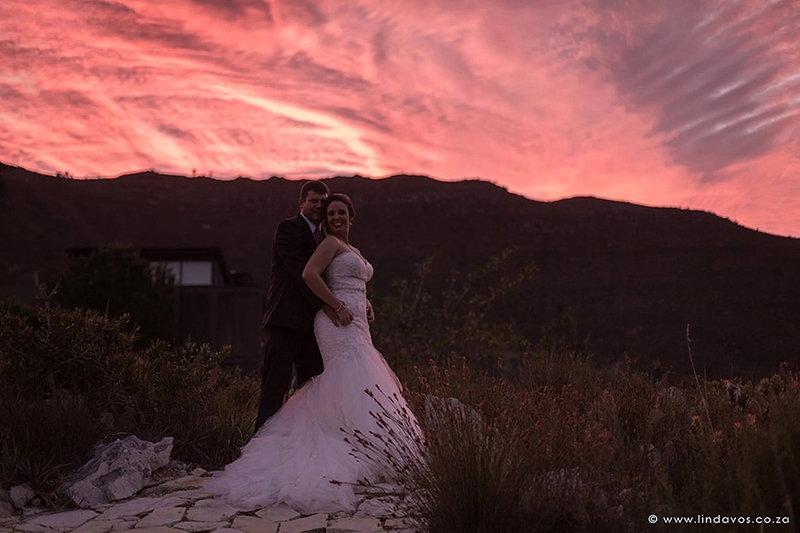 With an amazing sunset like this, natural light will not capture it with the couple visible unless you do a silhouette. 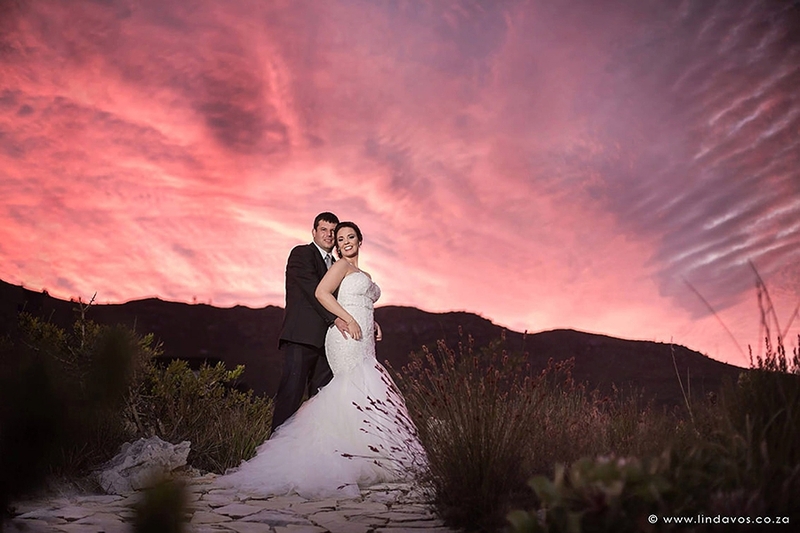 Using off-camera fill flash enables me to capture both the sky and the couple, resulting in a dramatic final image. Night photos need light and structures. If there are no suitable scenes at the venue, I look for small things that can help create an interesting photo. Here I am using the dim light from an outdoor area for a glamorous and romantic moment. When there are no interesting structures or scenes left at a venue for night photos and we have done all the options, creating something out of nothing is a last resort. 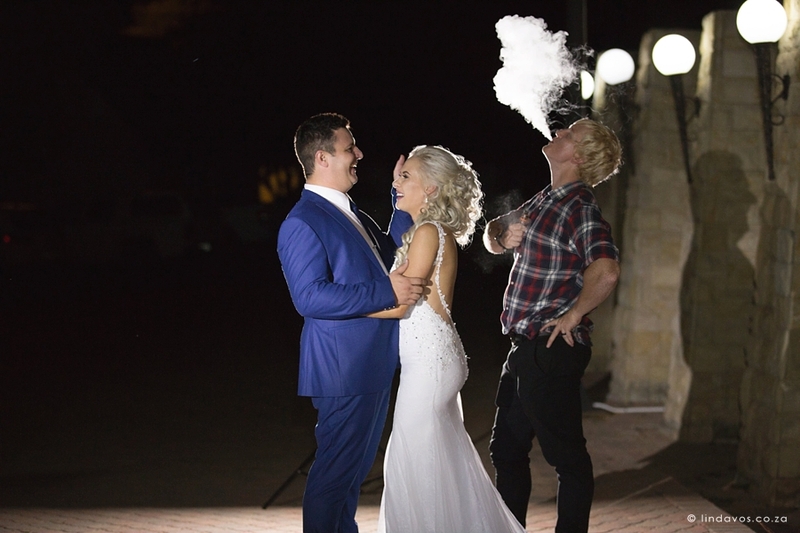 Here we used a e-cigarette from a guest to create a romantic smokey backlit effect.